The lower chain offers boating and water sports. Rent a pontoon boat or ski boat from any of the three marinas on the lakes. Take a canoe ride down the Crystal or Little Wolf Rivers. If you want to experience the quieter side of nature, paddle your canoe into the upper chain, eat a picnic lunch at Whispering Pines park and then paddle back. Take a fishing pole along if you feel like trying your luck. 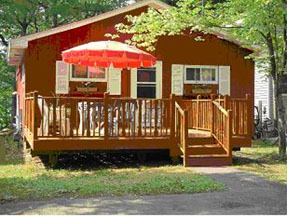 The cottage offers 4 bedrooms and 2 baths. It comes fully furnished with linens, towels, and kitchenware. Vacationing doesn’t mean you have to leave civilization behind! The cabin has a gas fireplace to take the chill off that occasional cool night and central air if the days are hot. High Speed Internet and cable TV take the blahs out of those rainy days. For a complete list of amenities click here A while back we added three kayaks for more water fun. Highly recommended! Our latest improvements aren't as exciting - new fridge, fixing the deck - but we are always working to improve your vacation adventure. Look around our site. Check out the pictures and rental information links on the right. If you’re serious about wanting to stay, prices and availability are here Click on How to Rent for the rest of the details on making your Chain vacation a reality.